R18 – This is seriously powerful stuff. 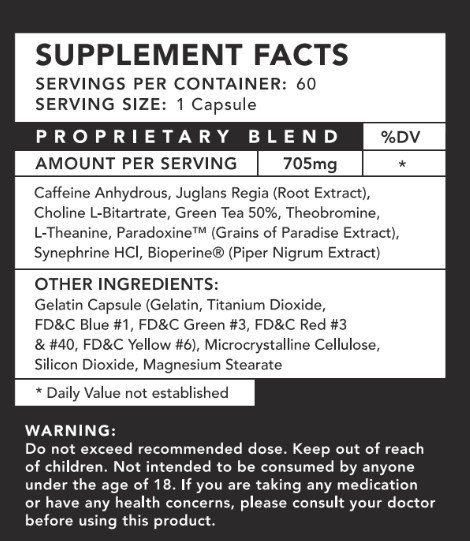 Recommended for people with high tolerance for stimulants. FIREBLAST ULTRA is a heavily optimized version of the original formula, carefully balanced to improve energy output and augmented with rare ingredients to increase heat and intensity. Only truly legendary wizards can handle these extreme levels of power. Those with the strength to control the inferno will incinerate every obstacle on their path to greatness. Ignite the fire within and set your barriers ablaze with an incredible surge of long-lasting energy, relentless drive and a fantastic mood. Vaporize your unwanted fat with red-hot thermogenics that work all day long to aid you on the journey to building your perfect body. Q. Is this the strongest version of Fireblast? A. Yes, definitely. This formula is based on the original version of Fireblast, tweaked and enhanced with new ingredients to be as strong as possible. Q. How is it different to Fireblast v2? A. Fireblast Ultra features Juglans Regia Root Extract for a crazy boost in energy and focus, plus Paradoxine® (Grains of Paradise Extract) for greater thermogenic power. A. If you find Fireblast v2 strong, we would recommend sticking with that version. Fireblast Ultra is significantly more powerful, and therefore best suited to people who need that extra kick or those who have developed tolerance to the standard v2 formula. Was impressed right away after having my cap of fireblast ultra. Noticed that I sweat more from it compare to the original version of fireblast when I have only used samples. Like the line for it what it says in the depreciation .Only true legendary wizards can handle these extreme levels of power. Made me think like the rat is a wizard. 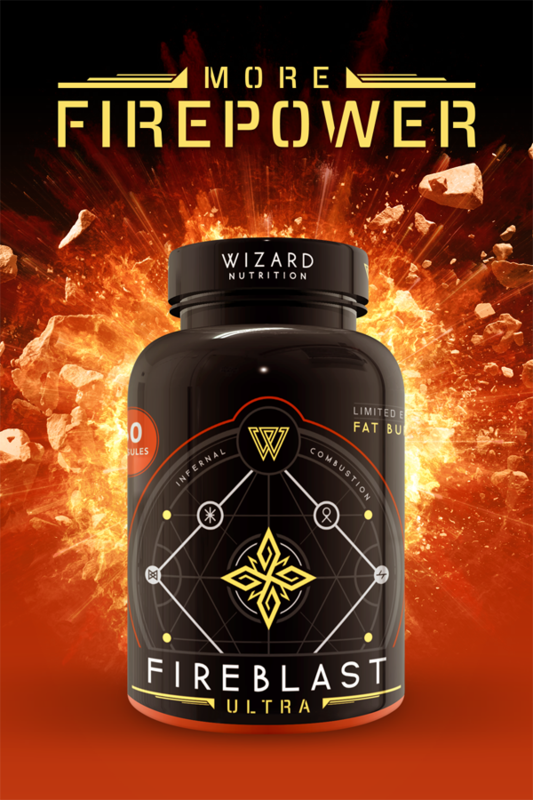 I\'ve used the first version of the wizard nutrition pill and it worked amazingly. I lost 11 kg over the months I was using it. on my second bottle, I kept to the version 1 and I kept that 11 kgs off. then v2 came out so I got it. I kept my diet and exercise routine exactly the same throughout all three of these bottles and I gained back 5kg while I took that version. all my sweet cravings came back and I wasn\'t getting the same level of energy that I used to in version 1 (this one) so im sticking to this version now. the originals still better though. by far. This Fat Burner so clean and steady.getting so much work done. One of the best fat burner i ever tried. This is an amazing product have used many fat burners over the years nothing works quite like Fireblast Ultra. The appetite suppression is so really great. Will work wonders for those that use this product. Best of all only need to consume once a day unlike others out there. Also you get a bang four buck as it has 60 serves. Summer is around the corner i would recomend this to anyone who is looking to shred and get ripped for summer or burn fat and tonne up in general. A Must use product. Best Fat Burner ever! Pretty dam impressed with this product. This stuff is RIDICULOUS! The appetite suppressant is un-matched, and the energy & mood elevation is unlike any other Fat Burner that I have tried. If you are fasting for long periods of time, or have trouble getting your appetite under control, Fireblast ULTRA will work wonders for you! Plus the 1 Cap a Day formula means that this lasts you over 2 Months! 10/10 From me. 10/10 From me, Hands down the most effective fat burner on the market at the moment. Feels exactly like the First version of fireblast, but a little bit stronger. Really like the fact it has Grains of paradise in it (Which provides a good thermo effect) - Love the clean smooth energy, but the appetite suppression is what i love, already lost 3kg in a couple of weeks!